We would all like to think we would bravely stand up for what we believe in against any tyranny, but I wonder. It takes a lot of guts not to just go along, especially when your life is on the line. 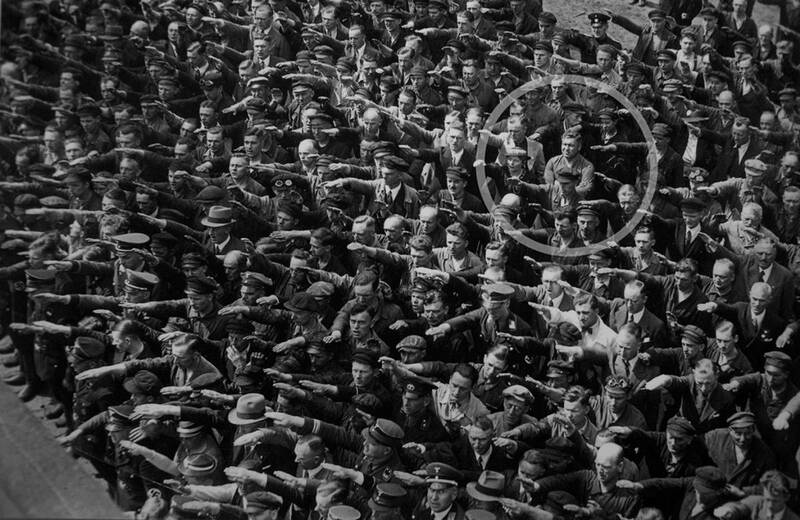 This man, refusing to give the Nazi salute, apparently died in captivity or was killed in 1944. Or the man is deaf and didn't hear the audible cue to salute? The awesome is strong with a guy who would put his life at risk just so that he wouldn't have to salute a regime that he didn't agree with. Why don't we all know his name, and why isn't there a holiday for him? Sadly, I honestly have to say I'd likely have my arm raised with the rest of the crowd, especially before I turned 50. Now, I'd like to say I'd have joined him, but I really can't be certain. I think until we're in a situation such as Germany faced in the 30's, it's hard to know how we'd react. I think more Germans were subtly anti-Nazi, than we realize, but with the demonization of all Germans during the war, their stories have never really been told, especially in the US. The best book I've ever read about an upper middle class German family, who in the 30's abhorred Hitler and the Nazis, was "Bonhoeffer: Pastor, Martyr, Prophet, Spy" by Eric Metaxas. I'd never before understood what an upright, Christian, German, family went through, and the choices they had to make, with the rise of Hitler. I search this photo in a good quality for a poster (= in order to make a big picture). Do you have this photo in 2 or 3 or more Mo pixels ? ?